Want to See What Final Fantasy XIV Looks Like? From alpha to beta to the latest batch of game screens, Final Fantasy XIV for the PS3 and Windows sure looks pretty. And big. Ever notice how much space MMO game designers slap between objects in these virtual worlds? Bar tables hewn from redwood trunks? Bars themselves big as amphitheaters? Sailing ships the size of castles? Castles their own metropolises? 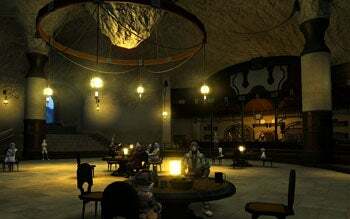 Check out these shots from Square Enix's upcoming uber-MMO, detailing the thalassocratic city-state (aren't they all?) of Limsa Lominsa in the realm of Eorzea. Thalasso-huh? A really fancy-schmancy Ancient Greek way of saying "sea rulers," according to Wikipedia. 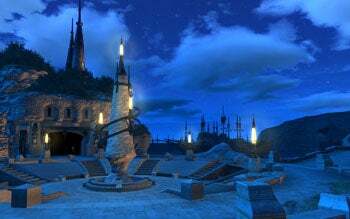 If you check out Final Fantasy XIV's website (under 'world', 'city-states') you can glean a shade more about this hotspot "on the southern coast of the island of Vylbrand, under the ancient cliffs worn by the relentless onslaught of the Rhotano Sea." It sounds like fishing's a sure bet (see "Fisherman's Bottom," where folks gather to "harvest the sea's bounty") as well as cooking (see "Bismarck," the "culinary capitol" of Limsa Lominsa). And if you've been waiting for details about the guilds, say hello to the Fisherman's Guild, adding its activities to the usual arms and armor suspects. 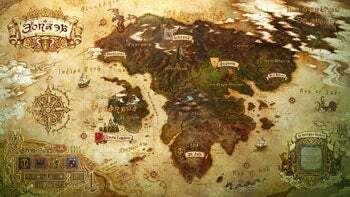 And how about a map of Eorzea (the game world) itself? Final Fantasy XIV will launch simultaneously worldwide later this year. Look for more details at E3 next month.